Restoring the original tonality to such great instruments of the past is the objective of our work. We carry out maintenance and repairs on string quartet instruments. Thanks to our large and experienced team, we are able to keep reasonable maintenance and repair times, provide quality service and an instrument on loan during the repairs. The construction of an instrument is a complex process with the final result being the creation of a particular sound. A large stock of both old or recent violins, cellos and violas which have either been entrusted or belong to us, is available for sale on our premises. We carry out rehairing and any type of repair or maintenance work on bows that have been entrusted to us. Tonal adjustments: we are specialised in finding and optimizing the tone for musicians thanks to our know-how and long experience in this field. Assessing the value of an instrument in different situations, for a transaction, when taking out an insurance policy or if the instrument has been damaged, is one of the quality services we offer. 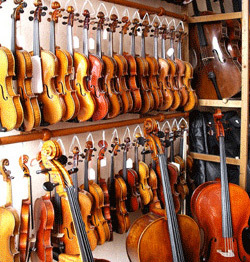 Violins, violas, cellos and double basses of any size from 1/16 to 4/4 are available to everyone.